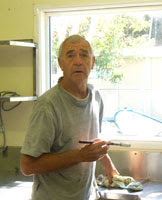 We held our last Working Bee down at the Boat Club on Saturday 13th June. What a brilliant day!! With 28 members attending, it had to be one of the most productive days ever. 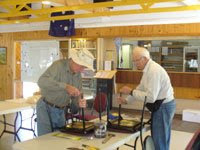 Mike and Ron got stuck into repairing the legs on our chairs, whilst Ole and Sid started on the kitchen. Check it out, it's gleaming white and freshly painted now. 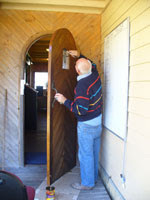 Barry varnished the front door and Margy was everywhere, helping out wherever she could. Outside, things were hotting up. 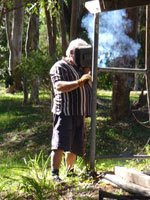 Brian donned his welding gear and started on the lean-to beside the boat shed. 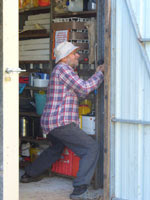 Peter worked hard on the pontoon and Phil (it seems) tried to support the shed - actually, he was repairing the door. 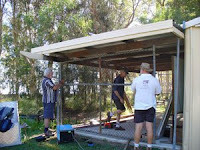 Guy supervised whilst Peter D and Brian continued to work on the lean-to. This will eventually hold one of the safety boats and a rack for our kayaks, leaving more room in the shed. It becomes very cramped in there, doesn't it? 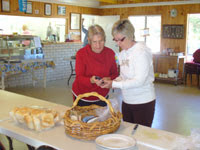 Meanwhile, back inside, Judy and Jill were preparing fantastic steak sandwiches for lunch. 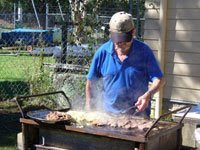 The steak was beautifully cooked by Barry on our bbq and served in fresh buns with tomato and onion. Yummo!! We even had a visit from Peter Dowling, our Member of Parliament. 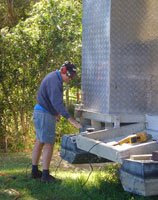 (No, he didn't pitch in to help but he did offer some valuable advice on our planned Access Walkway for Water Sports). Thanks to everyone for their invaluable help.